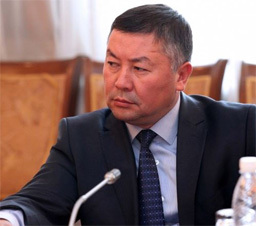 BISHKEK (24.kg) — The Bishkek City Court ruled to change the measure of restraint to the deputy of the Parliament Kanatbek Isaev for house arrest. Ramis Zhunusaliev, an employee of the Tax Service for Pervomaisky district of Bishkek, Deniz Raimkulov, the former head of Gavrilovka rural administration of Sokuluk district of Chui region, were also placed under house arrest. Kanatbek Isaev was detained on September 30, 2017. He is charged with attempted forcible seizure of power. The State Committee for National Security conducted the investigation. This is the second criminal case against the parliament member. The first, within which he was accused of corruption, was terminated after the expiration of the limitation period. The second one was sent for further investigation. When Isaev was arrested in late September 2017, Kyrgyzstan’s State Committee for National Security (UKMK) charged that he was conspiring with criminal groups to organize mass disturbances and “a violent seizure of power” around the October 15, 2017 presidential election. In June, Isaev’s Kyrgyzstan party nominated him as its candidate for the presidential election. However, election officials rejected more than 10,000 of the 37,000 signatures submitted in his petition of support, putting his application below the required 35,000 signatures. Sooronbai Jeenbekov won the presidency in the first round with 54 percent of the vote — enough to avoid a runoff — after a campaign in which critics said the outgoing president Almazbek Atambaev used courts, law enforcement, and other levers of power to bolster his candidacy.